The uprooted people of the twin islets of Ira’nai-theevu, located 12 nautical miles from the western coast of Vanni, have been waging a continuous protest for more than 8 months since 01 May 2017. They have been demanding resettlement in their native islets, which lie facing the Palk Bay. 8 years have elapsed since the end of genocidal war, the occupying Sinhala Navy is still adamant in its refusal to release the occupied residential, livelihood lands and the fishing coast which belonged to more than 2,500 people comprising at least 740 families before displacement. “We hoped that we could resettle in our village and celebrate 2018 New Year. But, we were deceived. If this situation continues after 01 January, we will have no other option than advancing our peaceful protest by proving our determination through sacrificing our lives even if it is necessary,” say the protesters. We are not opposed to anyone. We only seek our native village back to us, says 58-year-old Santhiyagu Vethanayagam, who is a coordinator/secretary of the protesters. Despite repeated assurances from the SL ministries, officials of the SL Presidential Secretariat and the Tamil parliamentarians trying broker with the SL State, the occupying SL Navy is not prepared to allow the people to resettle in their native islets. Why it has taken so much time is something we do not understand. It was also embarrassing to the survey department officials who completed their work months ago, says Mr Vethanayagam. “While everyone else celebrate New Year, we are languishing in these huts without any ray of hope” says 57-year-old mother Mudiyappu Jeyaseeli. From Naachchikkudaa to Ma'n'niththalai, the Poonakari region remains heavily militarised by the occupying military of genocidal Sri Lanka after 2009. The Indian Establishment, which should be concerned about the Sinhala military build-up has totally failed to consider its long-term security. India’s strategic interests are better served through ensuring resettlement of Eezham Tamils along the western coast of the Vanni mainland and through the de-militarization of the Sinhala military, is the opinion of Tamils on both the sides of the Palk Strait. Ira'nai-theevu islets are situated opposite to Kachchat-theevu in the Palk Bay. The people of Ira’nai-theevu twin islets, which are located 12 nautical miles west of Muzhangkaavil along the coast of Vanni in the Palk Bay, possess 400 years of continued Catholic legacy. At least 783 families were living in the islets until August 1992 when they were uprooted from their traditional settlement for the first time. The uprooted people moved closer to Muzhangkaavil in the Vanni mainland and created a coastal settlement known as Ira’nai-maatha-nakar, which stands for the township of St. Mary of Ira'nai-theevu. In 2007-2008, the occupying SL Navy entered the islets without any direct military confrontation with the Sea Tigers. By then, the people from the coastal settlement along the Vanni mainland had also started to move towards Mullaiththeevu as the LTTE controlled territory started to shrink during the genocidal onslaught. During the 2008-2009 genocidal onslaught on Vanni, the people of Ira'nai-maathaa-nakar displaced several times towards LTTE-controlled Vanni, finally reaching Mu'l'livaaykkaal. Later, the survivors of the onslaught went through the prolonged internment in the SL military run barbed-wire camps at Vavuniyaa. 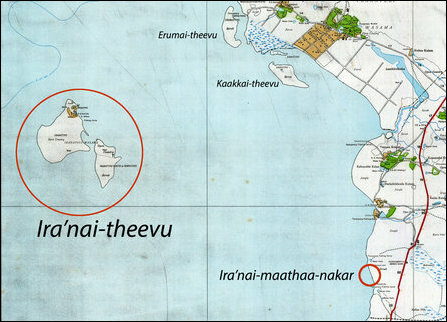 When the families came back to their temporary settlement and tried to reach their native islands, the SL Navy told them to stay away from Ira'nai-theevu. After the 2009 genocidal onslaught, the resettling survivors have been able to restore only one of their five traditional livelihoods, namely the long-distance fishing, and that too amidst severe hardships, the women say. During the times of the LTTE, the fishermen were able to reach the twin islets and reside there for days and engage on fishing and related activities as the Sea Tigers became a formidable defence force in the territorial waters of Eezham Tamils. Ira'nai-theevu was having a self-sustained economy and livelihood for all its inhabitants. Now, the people are only allowed to access their church in Ira'nai-theevu once every year during the feast observed during the first Friday in March. Even on that day, the SL Navy will be chasing the ‘visitors’ away after 4:00 p.m. Otherwise, anyone setting his or her feet on the island risks to get chased out or be detained by the occupying Sinhala Navy. In the meantime, some fishermen from other areas are being allowed by the SL Navy to engage in fishing from the island. The SL Navy has an income-sharing trading deal with those fishermen. There are thousands of stray cattle (cows and goats) in the island. These are born to cattle owned by the people before their displacement. The cattle could be spotted from the fishing vessels in the sea. The SL Navy regularly catch these cattle for its consumption. The SL Navy also sells these to outsiders through Naachchikkudaa. 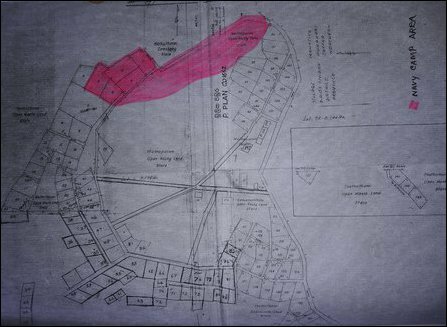 A detailed survey plan of Ira'nai-theevu North part, illustrating the pattern of land use carried out in the past. The area, marked in red, is a rocky area where there were no residences. That is also the area used for military purposes. Otherwise, the entire 1,200 acres of lands, that were utilised in the past for residential, fisheries industry or cattle farming, is now being commercially exploited by the SL Navy. Access to the coast and resumption of cattle farming are essential to ensure the livelihood of the people for a meaningful resettlement. 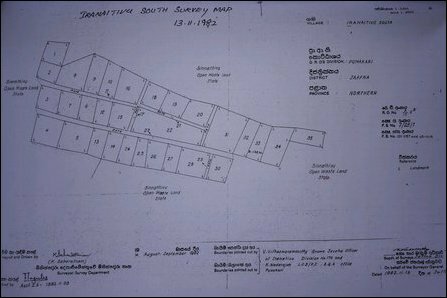 There were almost 190 concrete-built houses, which stood in good shape when the SL Navy occupied Ira'nai-theevu twin-islands. 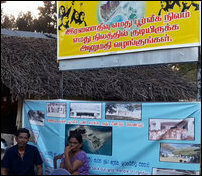 The representatives of the uprooted people, who went with surveying officials in 2017, were shocked to see majority of their houses being razed to the ground by the occupying SL Navy. Only around 45 houses have standing structures. Among these, 15 to 20 houses could be reconstructed without much investment. The occupying SL Navy should bear the responsibility for the full and partial destruction of 187 houses, the uprooted people say. The entire destruction has been carried out by the SL Navy for the purpose of construction material for its military purposes, they said adding that the people had only dismantled 3 houses before 2007.